Until recently, to be in a public place meant to feel safe. That has changed, especially in cities. Urban dwellers sense the need to quickly react to gestural cues from persons in their immediate presence in order to establish their relationship to each other. Through this communication they hope to detect potential danger before it is too late for self-defense or flight. 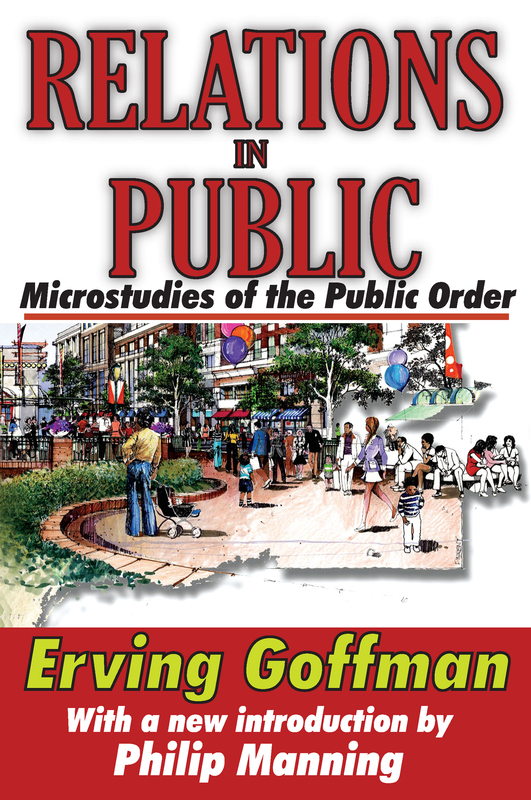 The ability to read accurately the informing signs by which strangers indicate their relationship to one another in public or semi-public places without speaking, has become as important as understanding the official written and spoken language of the country.In Relations in Public, Erving Goff man provides a grammar of the unspoken language used in public places. He shows that the way strangers relate in public is part of a design by which friends and acquaintances manage their relationship in the presence of bystanders. He argues that, taken together, this forms part of a new domain of inquiry into the rules for co-mingling, or public order.Most people give little thought to how elaborate and complex our everyday behavior in public actually is. For example, we adhere to the rules of pedestrian traffic on a busy thoroughfare, accept the usual ways of acting in a crowded elevator or subway car, grasp the delicate nuances of conversational behavior, and respond to the rich vocabulary of body gestures. We behave differently at weddings, at meals, in crowds, in couples, and when alone. Such everyday behavior, though generally below the level of awareness, embodies unspoken codes of social understandings necessary for the orderly conduct of society.